I have started reading the widely popular “The life-changing magic of tidying” by Marie Kondo. It had been in my wishlist for quite some time and finally I bought myself a copy of it. Once I finish reading it, I’ll write a detailed review. For now, let me share my experience from yesterday of rearranging and organizing my wardrobe using the Konmari method. I had finished the chapter on clothes and was excited about attacking my wardrobe yesterday afternoon. I thought to myself, “Clothes are easy. I don’t buy a lot of them. I should be able to clear them in an hour’s time before D comes back from school”. The “before-Konmari” Anu would have moved from one shelf to another when she cleans. 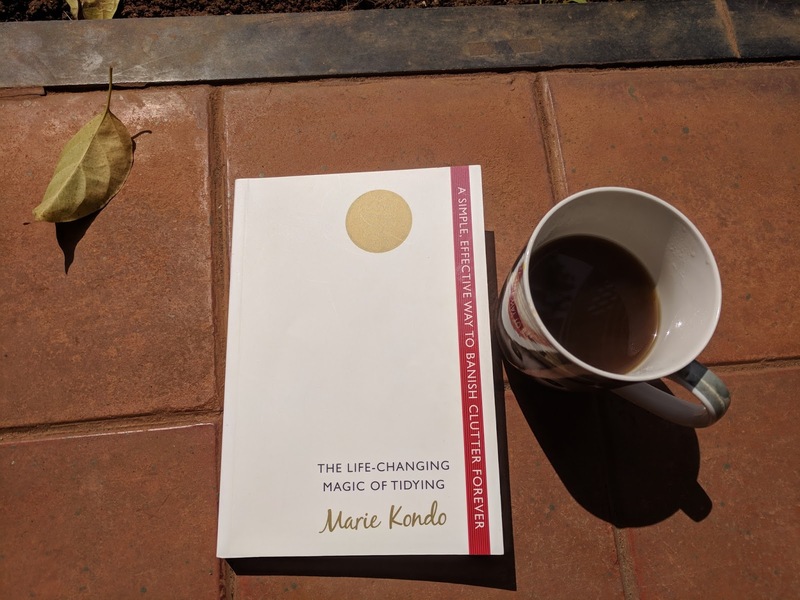 But “after-Konmari”, she had to follow the book diligently and bring down every single piece of clothing on the floor. As much as it made me very uncomfortable, I went ahead with it. Summer clothes sorted and put back in a corner of the top shelf. BTW, those were swimwear, swim cap and a robe. Winter clothes grouped (a sweater, a jacket and a couple of shawls) kept in an accessible location in one of the shelves. Night pyjamas, yoga t-shirts and pants - done. Dumped a few of the old t-shirts that I no longer need in a corner. “Wow, that was quick”, I patted myself on the back after 15 minutes. Then started sorting the tops and kurtas. I picked each item and asked myself the most important decision making question, “Does it spark joy?” Forget about “sparking joy”, some would take away whatever joy is left behind. That was the story of my 2-year-old FabIndia kurtas - faded and looked so dull. For the price I paid, I would have ideally kept it back and used them for 2 more years. But this time, I decided to give them away. They taught me an important lesson - “never buy such expensive clothes from FabIndia ever again”. I know many of my friends swear by its clothes but it is just NOT for me. Another 15 minutes, tops, kurtas and salwars done. A shopping bag full of clothes to be disposed. “I’m proud of myself today”, I shouted. Little did I knew what was coming next. Before we proceed, let me admit I LOVE sarees but I don’t wear them often. I have a shelf full of them - cotton, fancy embroidery, silk. As I started to sift through them, I realised I haven’t air-dried my silk sarees in a while. Off I went, unfolded all of them and spread them on my bed, fan switched on at full speed. For a few hours, my room smelled like a kalyana mandapam. Meanwhile, it was almost time to pick up my daughter from school bus. As she came into the room, she asked me,”what is all this?”. “I’m air-drying my silk sarees”, I replied casually. Even before she heard my reply, she jumped on the bed, “wow it is so nice!”. I slowly diverted her attention and took her away from the war zone. While D ate her lunch, the sarees were breathing some fresh air. Then I started the heavy-duty task of refolding my silk sarees. “You skipped your yoga class today na. Now do the arm workout”, my mind gave me a sarcastic laugh. Ladies, if you want to get strong arms, do take up this task of unfolding and refolding your heavy silk and embroidery sarees often. Even better if you have 9-yard ones. I wonder how my grandmother washed, folded and wore a 9-yard madisar every single day. If it was me, my half-a-day would be gone, just executing these 3 steps. As I folded each silk saree, “does-it-spark-joy?” question felt redundant. Ofcourse, it does. Brought back memories of my engagement, wedding, reception, seemantham, my brother’s wedding when D wouldn’t leave my arms while I performed the required rituals and many more. 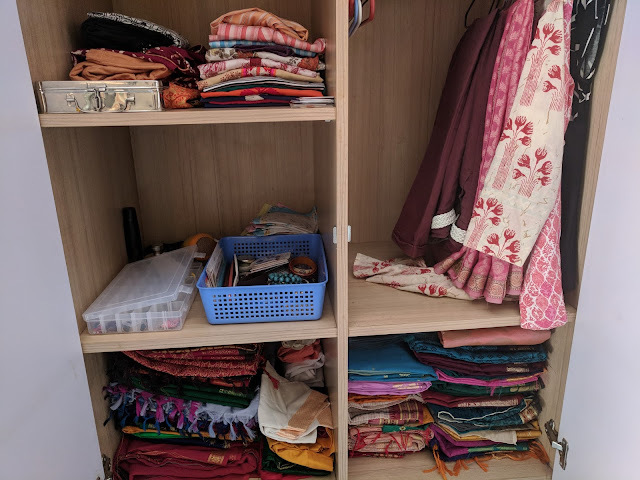 Smile, nostalgia, deep sigh when folding the saree bought by my maternal grandparents for my wedding and an emotional tear holding my mom’s silk saree from 25 years. Some emotional eating (strike that, emotional hogging) happened, thanks to yummilicious plum cake that hubby dear bought from a famous bakery in Frazer Town. It was almost evening by then. ALL sarees went back to the cupboard and I promised myself that 2018 will be my year of sarees. All that were left behind were the accessories. I don’t have any makeup or personal care products, except for a natural lip balm. By then, D was getting bored and wanted to “help” me. As soon as she saw the bangles and clips, she got too excited. She helped herself to a cute pony tail, a few bangles and a necklace. “Let’s go to play area”, she insisted. We returned home after an hour and then I spent one more hour to clear up the remaining knick-knacks. So after 7 long hours that felt like eternity, my wardrobe is FINALLY organized. I’m dreading the next chapter of Konmari method because it is about “BOOKS”. They are everywhere in our home and it’s going to be a herculean task for sure.